At the Haycock supervisors’Aug.1 meeting, resident Julie Fagan used extraordinary measures to show she really wanted the board to seek designation for the township as a National Wildlife Federation Community Wildlife Habitat. She did this by covering her torso with a large, school bus yellow cylinder around which black electrical tape was wrapped in horizontal stripes, placing a headband with antenna- like protrusions on her head and wearing black tights and yellow socks. 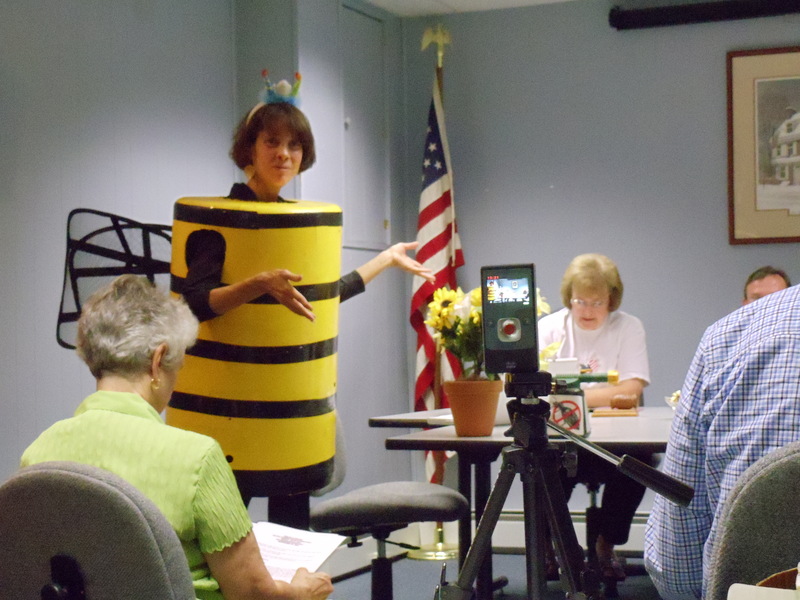 Supervisor Henry DePue said:“I’ve seen it all now.” “I did dress up as a bee,” Fagan told the board. “That should achieve some points.” The bee costume probably was not what convinced the supervisors to unanimously agree to ask the National Wildlife Federation for the designation. It was that Fagan reported more than 50 residents had sought certification for their backyards as backyard wildlife habitats. At least 50 backyards must be certified by the federation as backyard wildlife habitats for the township as a whole to get community certification. At the supervisors’ July meeting, board members told Fagan they wanted to make sure the community supported her idea before they backed it. The National Wildlife Federation, based in Reston, Va., calls itself the nation’s largest conservation organization. It aims to protect and restore wildlife habitats and combat global warming, according to its web site. While individual residences that have backyard wildlife habitat certification have individual goals for their backyard habitats, Fagan has established goals for Haycock Township as a whole, including saving declining bat and bee populations, removing invasive plants and replacing them with native plants and limiting the use of environmental poisons. Fagan told the board at its Aug. 1 meeting that scientists noticed in 2006 that honey bees were dying at alarming rates. The decline is important because honey bees pollinate 30 percent of the food supply. Pesticide use is believed to be a factor in the decline, according to Fagan, a Rutgers University professor. “Our mission is to support the bee population and get residents to be aware of what they put on their land,” Fagan said. “The initiative will promote healthy habitats.”Fagan also has said the project would bring the community together toward a common goal and foster environmental education and awareness. Fagan has information about the proposal on a blog at haycockwildlifehabitat.wordpress.com.